Summer has finally arrived in Stockholm, well, for a few days anyway. It's been so hot that one needs cold beverages and light layers at all times in order to cool down. So we've been drinking lots of delicious cold tap water, preparing more smoothies, and enjoying ice cream for a treat. But not just any old ice cream, this is a vegan-based ice cream, on the lighter side of things. I was inspired by this post that relied on a VitaMix blender. I don't have a ViaMix or an ice cream maker, but I was determined! I love Häagen Dazs's butter pecan ice cream and have been dreaming of going home and feasting on it like I used to. And thankfully, you can't get it in Stockholm, so it's limited to a yearly treat. Well, not anymore! I ended up making a healthier version of it without intending to! And I didn't realize I'd get so close to the real thing. I've been trying to find more information on how coconut products affect the body. I've read that even though coconut has saturated fats, that they are different from the ones found in dairy and meat, and that our body processes them in a more positive way. I am not sure how true this is, even though many people have jumped on the coconut bandwagon, but I don't see why we shouldn't enjoy coconut occasionally. Surely it's better than heavy cream? And then there's the question about BPA in coconut milk cans. I haven't found any products indicating that they are "BPA free" here in Sweden, but I have seen tetra packs, so I try to buy them instead, hoping that this resolves the BPA issue. This dessert is a cross between a sorbet and ice cream. 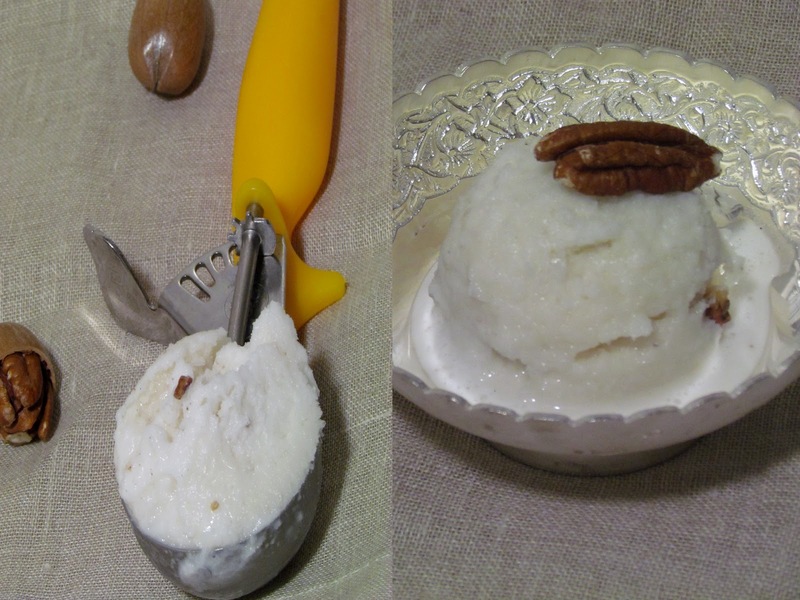 Because of the buttery pecans and vanilla, it doesn't have a prominent coconut flavor. It does have a few tiny ice crystals if you make it without an ice cream maker, but honestly, I don't mind! It gives me enough creaminess in order to satisfy a craving, helps the body cool down on a sultry afternoon, and tastes divine, so I'm delighted! It does take a little bit of babysitting to turn it into real ice cream, but it's worth it! 1. Heat milk with sugar until the sugar is dissolved. Add the coconut milk, salt and honey and stir well. Freeze until almost frozen, about 30 - 45 minutes. 2. Using a stick blender, break up the ice cream and blend until smooth. This can also be done in a food processor. Re-freeze until almost frozen, about 30 - 40 minutes. Repeat 3 times. 3. Saute butter and pecans on medium-low heat until just toasted, and let cool. After the last blend, add the vanilla extract and butter pecans to the ice cream and stir. Freeze. 4. When ready to serve, allow the ice cream to thaw for 5 - 7 minutes before scooping. Enjoy!